He is being cast by some supporters as an old champion of the First Amendment, defending the rights of ex-reporters everywhere to pontificate freely about matters of public concern on the front pages of one of America’s most respected daily papers. “Even in middle school he was shooting his damn mouth off for no apparent reason,” says Kurtz’s ex-5th grade teacher, Danielle Fishbaum. But to others, Howard Kurtz, the media critic for the Washington Post, is just a pompous windbag. 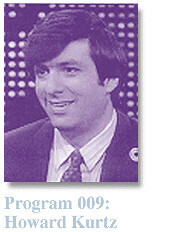 Controversy also surrounds Kurtz’s online column for the Washingtonpost.com,“Media Notes” an endeavor on which he appears to spend an increasing amount of time. The legitimacy of Kurtz’s weekly TV show, “Reliable Sources,” is also a matter of some dispute. “I don’t know which is worse, yapping on TV for an hour about the news media after doing it all week in print, or inviting your reporter friends—people who claim on the other six days of the week that they are ‘objective”—to come on the show with you and get paid to foist their opinions on the pubic,” adds Flashdance. No matter how what the 24-hr cable networks have dubbed the “Kurtz Kontroversy” is eventually resolved, Squib expects the larger disputes to continue for some time. For more on the Josh Wolf case, see the February 22 issue of The Indypendent.